A new series of 4 TV shows featuring John Hanson and Dawn Holloway's ground breaking series of encyclopedias covering British UFO cases. 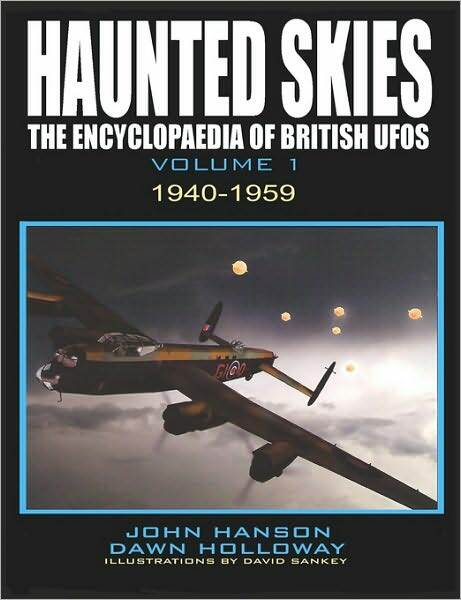 Starting from 1940, these books provide a detailed picture of the sheer quantity of solid UFO sightings over the decades. In this first interview we speak to James Salandin M.B.E. a retired RAF pilot who witnessed 3 UFOs in the 1950s. In the third show with UFO researcher John Hanson we look at incidents from the late sixties. Hundreds of people witnessed a UFO known as "The Flying Cross", described as a biblical looking cross covered in lights flying about the English countryside. The cross was chased by police officers. Also discussed is the craft witnessed by air steward John Greig in 1967 where a spherical metallic looking craft was witnessed over Heathrow Airport. Similar objects have been reported many times in the past. In this fourth and final show covering the work of ex police officer John Hanson we speak by telephone with two UFO witnesses. The first who is also a retired police officer witnessed a large UFO hovering over the river Nene whilst out fishing. Following the encounter the witness experienced unexplained health problems including a scar on the brain. He also communicated with the MOD, who allegedly started following his wife. The second UFO witness had a strange object come out of her nose, could this be an alien implant? The object was studied under electron microscope by staff at Manchester University. It is made of "hydrocarbon", but only limited testing could be undertaken. We are keen to have a more detailed study of the object carried out to see what is inside.